The process begins with the craftman, in charge of the work, drawing a preliminary sketch obtained from the committed design. Then a selection of materials considered most suitable for colours and “macchiatura” (spots pattern) is made. Models are then shaped in order to separate the different parts of the design. Once applied to the chosen materials, they are used to colour the shapes of the different subjects. Here starts the real artistic phase of the process for, together with the craftman’s dexterity, a sensitivity for shaping stones is needed. Cutting, modelling and gluing the different pieces into one whole are moments in which care and concentration as well as experience and manual skilfullness are most needed. 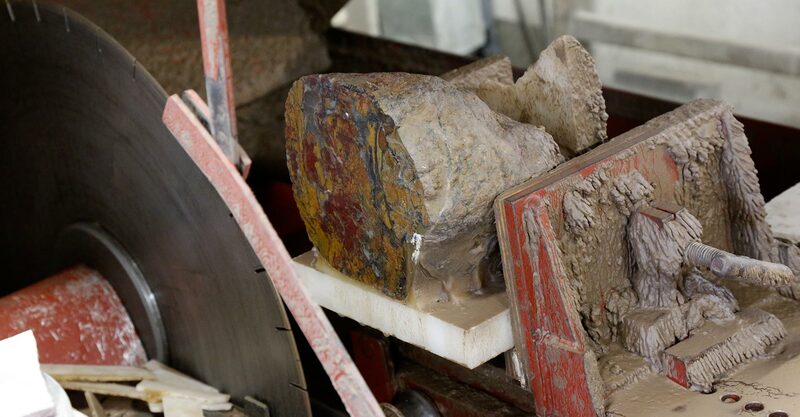 Once all parts are pieced together, smoothing and polishing occur. This is undoubtedly the most difficult stage, since a mistake would frustrate several days’ work: this operation still requires to be carried out completely by hand. Only extreme care and experience will deliver that sort of brightness which intensifies the colours of each stone used. "precious stones mosaic: even a precious stone wants to be something"
So wrote Vasari. Indeed, thanks to Lorenzo il Magnifico and to the wonderful historic and artistic period known as the Florentine Renaissance, the tradition of the mosaic art was retrieved. Vasari also mentions a table committed by Cosimo dei Medici’s son, Francesco, around the first half of the XVI century. It may be too early to talk of “commesso” mosaics in semi-preciuos stones, but it is still an evolution of the opus sectile. In that period, several works were done throughout Italy: in the Certosa of Pavia, in the Milan churches of S.Antonio Abate and Santa Maria della Passione, but also in Cremona, Treviso, Venice, Naples, and Rome, in Palazzo Farnese, just to mention one example. And the same can be said for other cities in Italy and abroad. It was under Cosimo’s sons that the studios in the Grand Duchy of Tuscany flourished even though many famous ones were then destroyed. Meanwhile, some florentine churches such as S.Maria Novella and S. Spirito began adorning a few chapels with “commesso fiorentino” tessera pattern thus paving the way for the wonderful and unique building of the “Cappella dei Principi” besides S.Lorenzo church. The quality and stylistic subtleties of this chapel as well as of the altar and other minor works in S. Lorenzo church is rarely matched in other cities. Some beautiful cabinets decorated with tiles made in commesso were done at the beginning of the XVII century. During this period many tables were also done, a few of them designed by Ligozzi, which were put in the most important dwellings of the time such as the Duke of Mantua’s or the Farnese Cardinal’s, just to mention but a few examples. The most extraordinary table top is undoubtdely the one done by Monnicca girdled with flowers on show at the Uffizi Museum. The studios of the Grand Duchy of Tuscany created many works which can still be admired today not only in different churches and museums in Florence but also in Munich, Karlsruhe, Copenaghen, Vienna, London, Madrid, St. Petersburg, Naples, Paris, Prague and in many other towns. This technique met with such a success that “studios” were opened in Paris (Gobelins), Madrid (Buen Retiro) and Prague thanks to Rodolfo II. The Grand Duchy studio went on working throughout the XIX century, after changing its name to “Opificio”, but artistic taste had meanwhile evolved. Many small studios went on creating works which have contributed to hand down to us the pleasure, techniques and artistic skills of commesso fiorentino. 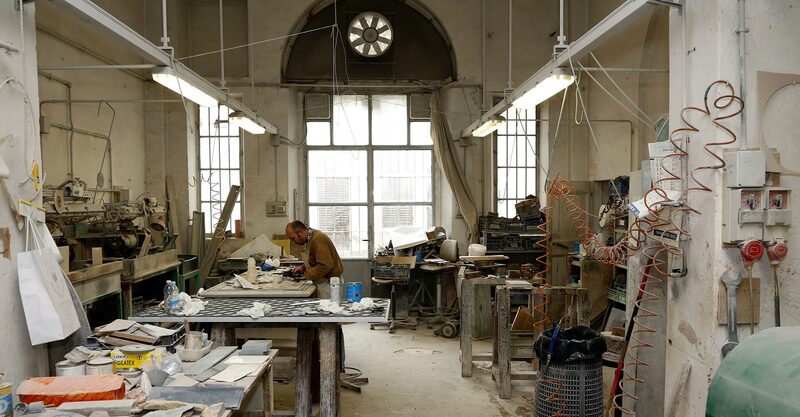 Florence Mosaic carries on this tradition today in its premises where young craftsmen led by expert masters create handycrafts in marble and semi-precious stones mosaics. "The Florentines, who most fully developed the form, however, regarded it as 'painting in stone'."